Texas Tables, an “Award-Winner in the Cookbooks: Regional category of the ‘Best Books 2010’ Awards, sponsored by USA Book News,” is the inspirational second cookbook from the Junior League of The Woodlands. Texas Tables is inspired by the lifetime of memories and emotions associated with the dining tables in homes and the priceless family moments that occur around them. The relaxed, yet elegant southern hospitality of the League’s service area is reflected through the books delicious recipes and color photographs. This book takes home cooks on a journey of culinary creation and personal recollection with its 240 delicious recipes from family, friends and local celebrity chefs – Americas-The Woodlands, Exec. Chef and Owner Michael J. Cordua; Amerigo’s Grille, Exec. Chef Carl Waker; Damian’s Cucina Italiana; Jasper’s, Exec. Chef Kent Rathburn; Perry’s Steakhouse and Grille; Sorrento Ristorante; The Capital Grille, Exec. Chef James Nuetzi; Tony’s, Exec. Chef and Owner Tony Vallone. 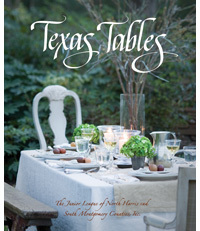 In addition to being our first “green printed” book, Texas Tables includes heart-warming stories of favorite table moments and over 60 gorgeous photographs by nationally acclaimed food photographer, Terry Vine. It also features sidebars that relate to interesting facts and tales about people, places and events that represent the many tables that make up our North Houston community. It is truly our hope that our stories and recipes in Texas Tables can warmly extend to your families’ tables, wherever they may be!